Every once in a while, Chauncey and I get a date night. A couple of weekends ago, our parents were in town, so we headed out to dinner, then drinks with friends at West Main Crafting Co. in downtown Lexington. Our friends recently opened West Main, and we really enjoy the atmosphere, drinks, and food there! This outfit was perfect for a night out on the town. I’ve become slightly obsessed with cold shoulder tops lately. This one had the cutest ruffle detail that makes it flirty. It’s on sale under $25, and also comes in a red tropical pattern, black, and white. My white jeans go great with it. 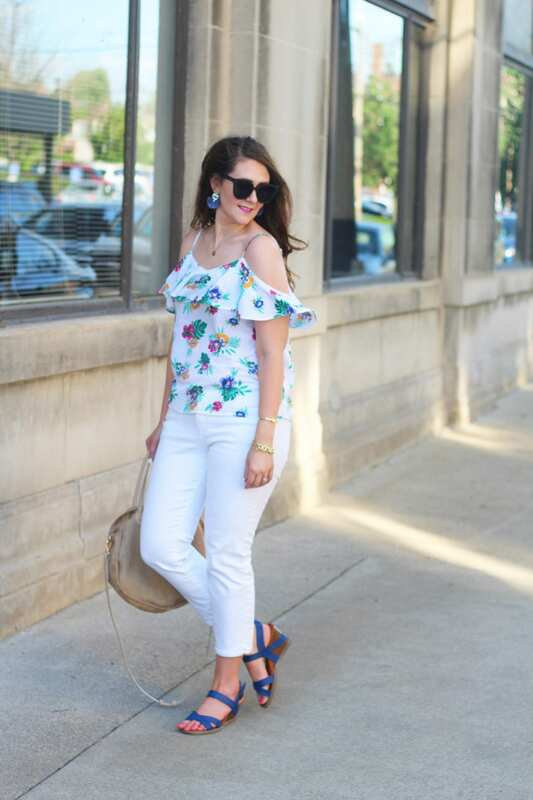 Not only are white jeans my go-to right now, but an all-white look is just so summery! When picking accessories, I always try to select an accent color from my outfit to “pick up” and carry through. Here, I added blue earrings and blue wedges. These wedges are so amazingly comfortable! They’re actually from Bearpaw, and you can save 15% off your order (US ONLY) when you use code BA17IU4JST. I finished the look with a neutral bag ($25!) and gold jewelry. If you are looking for a new summer bag, look for one in a natural (tan) color and in a round shape. That top is gorgeous and I love it with the white jeans! Thanks, Mary! I think it’s so fun! Gotta’ love a date night and a reason to get all cute. Love the look! Thanks so much, Lisa! And exactly! I love the white floral and white jeans together! Date nights are always fun (and rare) for us here too so we really enjoy getting out when we can! Thanks, friend! I’m glad we’re not the only ones. But I think that having alone time is so important! Aww, thanks, Grace! The brighter, the better! Thanks so much! I want to add the pair from Old Navy that’s stain resistant! 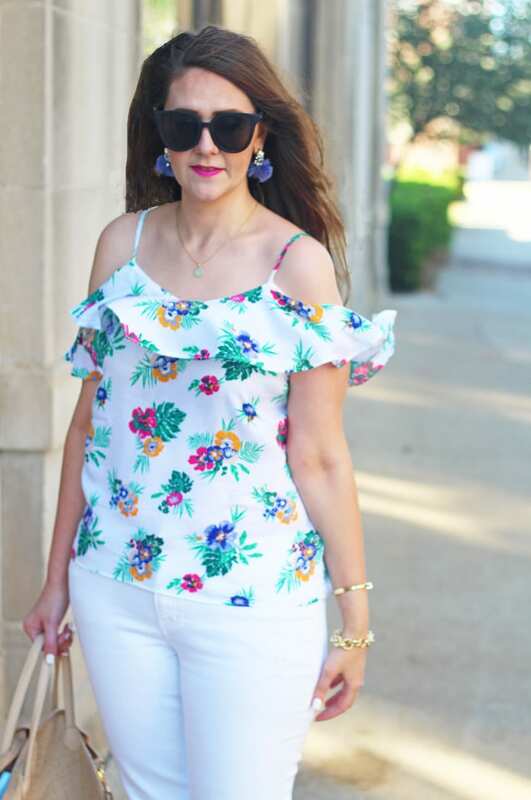 Love a cold shoulder top, especially one with a ruffle! This look is so bright and Summery. Beautiful! I am not a cold shoulder person and I think I figured out why! I need to wear a bra! lol. This outfit looks great on you! Haha. Here, I wore a strapless one. I’ve definitely seen some cold shoulder tops with straps wide enough to wear a bra with–maybe try one of those if you seen one out? Oooo I love that you paired this with white jeans! Summer perfection! Thanks, Nicole!11 Love white jeans! Thanks, Chloe! 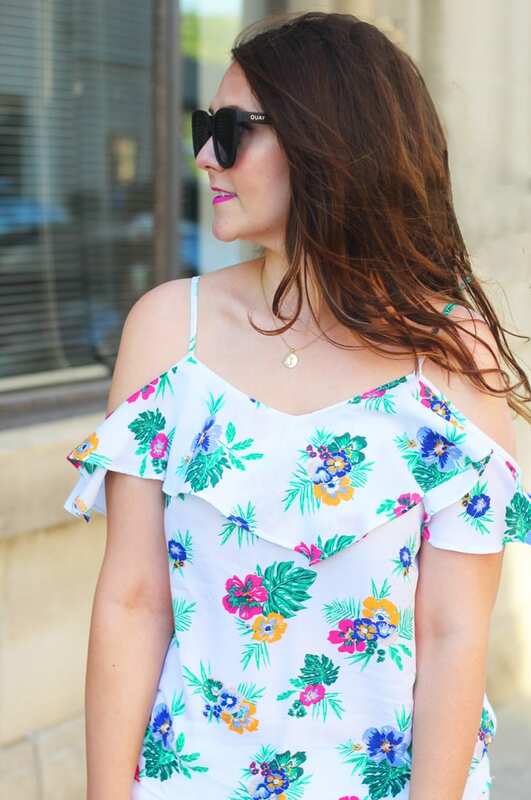 Definitely a fun top for spring! I really love that colorful top you have on. I am in love with color lately! You look fabulous! Thank you for joining Ladies Who Link Up today! I hope you will join us for our Instagram only link up on Monday! Peace! 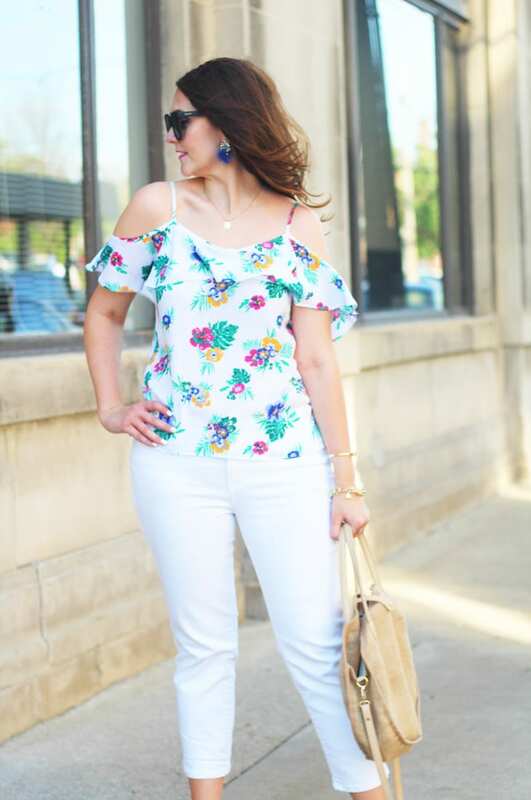 You look fantastic in your cold-shoulder top! 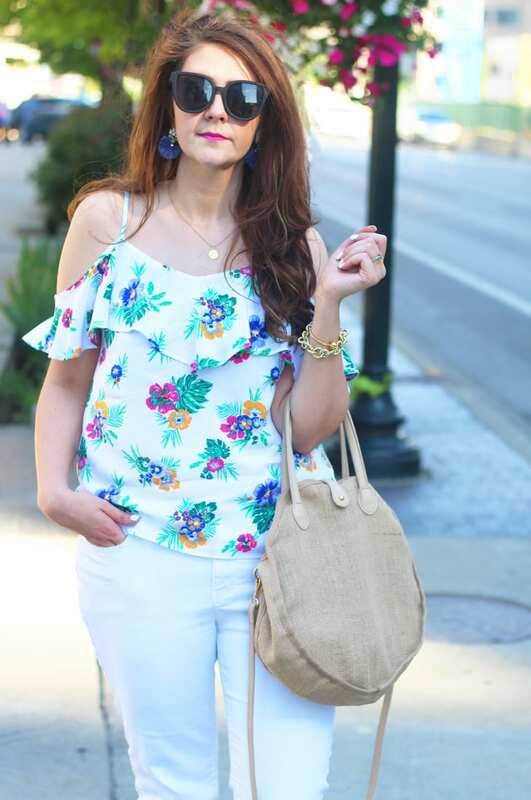 I’m loving white pants and colorful tops this season. Have a great weekend! Such a cute top! You look fabulous and all your accessories are on point! I love how simple yet pretty that top is! Very pretty top! It looks fantastic with your white jeans and blue accents. Love your blouse and the wedges too, such a pretty blue. Thanks, Nailil! I love the color of the wedges. Such a pretty top! Glad you guys were able to have a date night! What a beautiful top!! Love the ruffles. Thanks, Heather! I have a ruffles addition. Love your beautiful top, looks so pretty with t he white denim. Love bright colors.